In Part I of this thread (immediately following), I described some of th details of the proposed layout of the station in the Recommended Plan for revitalization. The entire project is complex and there are many issues surrounding it. The Union Station Revitalization Public Advisory Group, of which I am a member, gave a deputation at the Executive Committee meeting on November 26. Our proposed changes to the process now underway were not accepted by the Committee, although we hope to get more exposure for and attention to them as time goes on. The implementation plan, which will now come back directly to the upcoming Council Meeting, will not be subject to public discussion before that meeting. There is no governance plan in place, and it appears that the City is heading down a path to managing the building directly rather than through a board such as those that manage other City properties. For those who have been following my analyses of problems with TTC streetcar operations, David Cavlovic has sent along an article from today’s Ottawa Citizen. Toronto may have its problems, but Ottawa sounds even worse, including a lacklustre attitude by senior management. At least here, there is a glimmer of recognition that service could be better. The company has spent a lot of money on a GPS system, but it lacks the software to analyse where service problems actually lie. TTC’s signpost-based CIS has been in place for over two decades, but analysis of its data waited until I undertook it and started publishing results here. CIS will be updated to use GPS information from vehicles where this is now available thanks to the stop announcement system, but we have yet to see whether the TTC will actually analyze its operations with all of the data at its disposal. Weekend operations on Queen have some problems in common with the weekday service, but these show up at different times and locations. In place of rush hour effects, the line is affected by shopping and entertainment-related congestion that builds and ebbs over longer periods. A reader, Vic, remembering my fondness for Swan Boats as the only possible solution to our transit woes, sent along a link to an article in the Long Beach (California) Press-Telegram. I know that many people who read this blog don’t use an RSS feed to see recent comments on old threads, and since the last post about Swan Boats was last July, I thought that you wouldn’t want to miss this. The article details (with lovely photos) the seven-week project by Sierra Brown to commute to class once a week by different human powered forms of transport. The grand finale was an 11-mile paddle by Swan Boat. [For those who are wondering where their comments are: Several of these touch on the question of Transit City project costs. I plan a separate post on that topic and am holding your comments until that is ready. 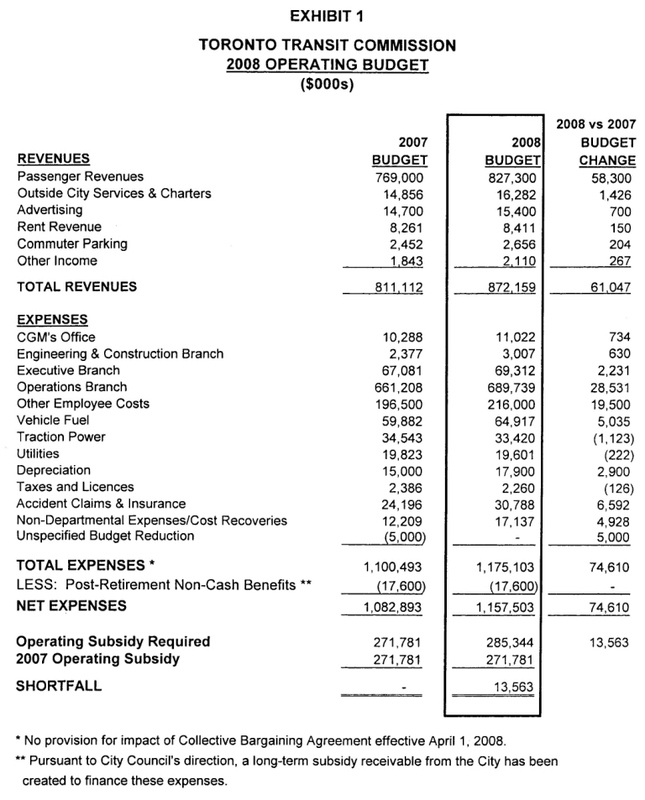 On November 14, the TTC considered its 2008 Capital Budget. Although there are major issues with funding of many projects, especially on a long term basis, the budget has been passed on to Council. One important approval, made with the concurrence of the City Budget Committee, is that work can begin on the three top-priority Environmental Assessments for Transit City: Eglinton-Crosstown, Sheppard East and Finch West-Etobicoke. This work will stop Queen’s Park does not make funding available as part of their budget announcement for the fiscal year starting in April 2008. The Capital Budget presentation at the meeting is not available on the TTC site, nor are several tables and charts from the main report. 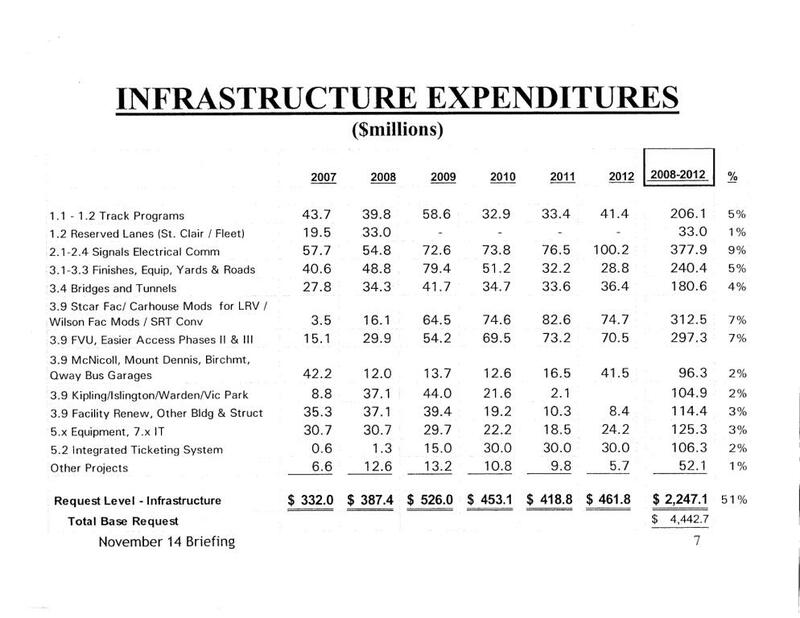 The 2008 Capital Budget Summary gives a broad overview of the five and ten year projections. 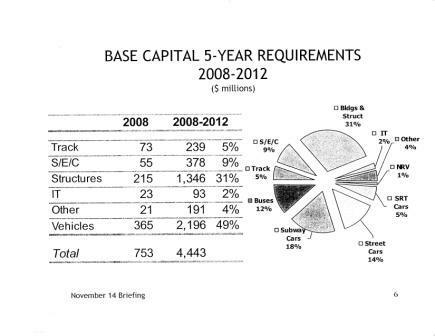 The 2008 Capital Infrastructure and 2008 Capital Vehicles tables give some break downs. 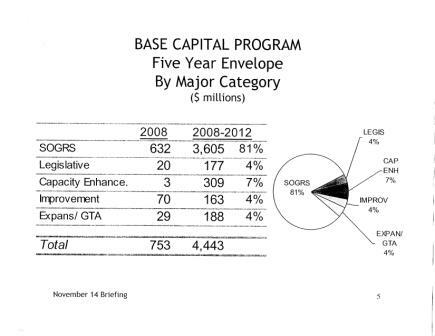 The 2008 Capital Base Program By Category shows that 81% of the capital budget is allocated to State of Good Repair. 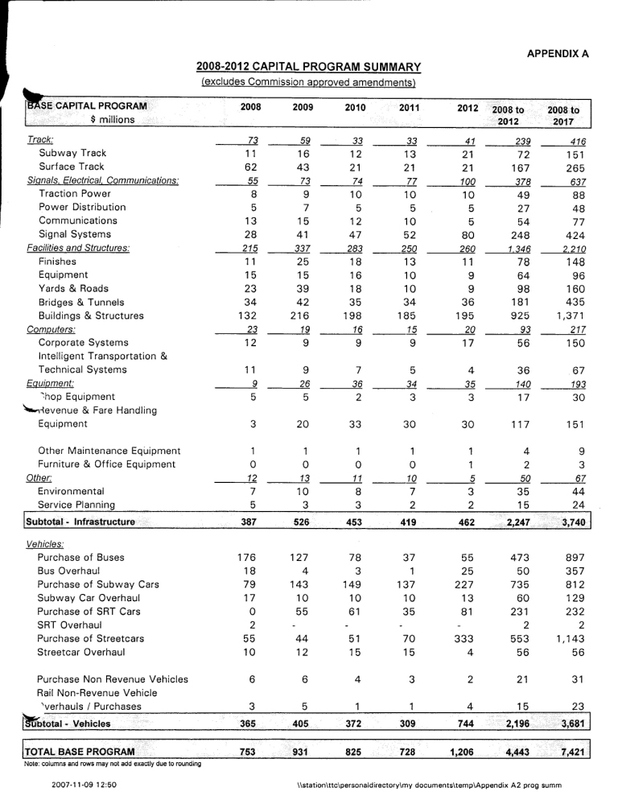 The 2008 Capital Program By Major Cost table breaks down the same information from the summary into a pie chart. 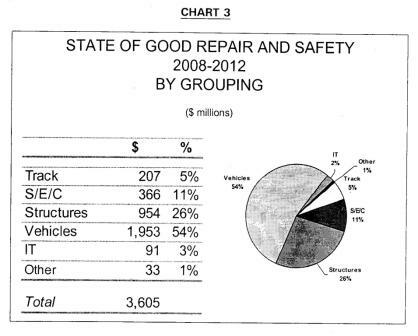 The 2008 Capital State Of Good Repair Summary shows the proportion of this category consumed by each major area. Vehicles account for over half of this. Growth and system renewal drive many aspects of the budget. Peak period riding increases the fleet and garage space requirements. The shift to low-floor buses reduces vehicle capacity and increases the size of the fleet needed to handle demand. This changeover will be completed by 2010. Replacement and expansion of the streetcar fleet for the existing base system plus planned additions such as the Waterfront lines. Replacement and expansion of the SRT fleet both for capacity and for the proposed extension to Sheppard & Markham Road. 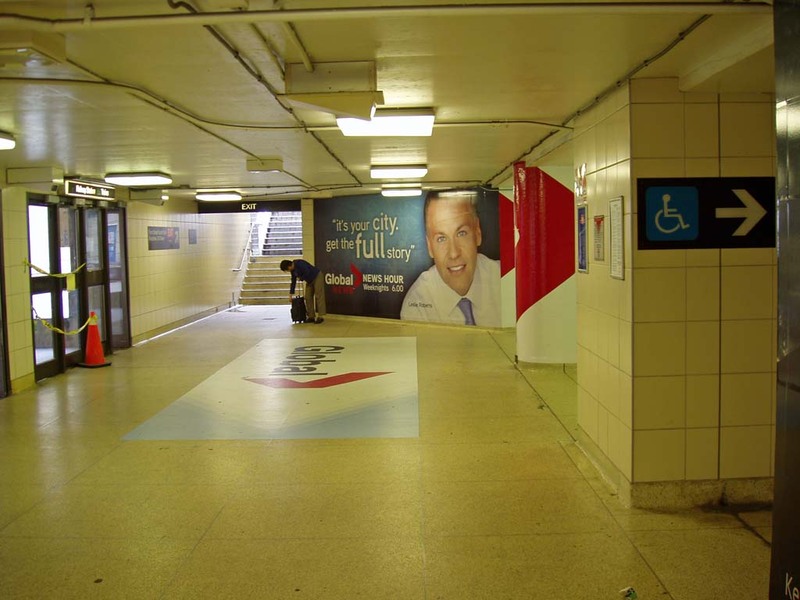 Expansion of the subway fleet and partial replacement with new cars to increase capacity on the Yonge-University line. Transit City will add seven new LRT routes to the network. Subway expansion on both the Spadina/York and North Yonge lines. 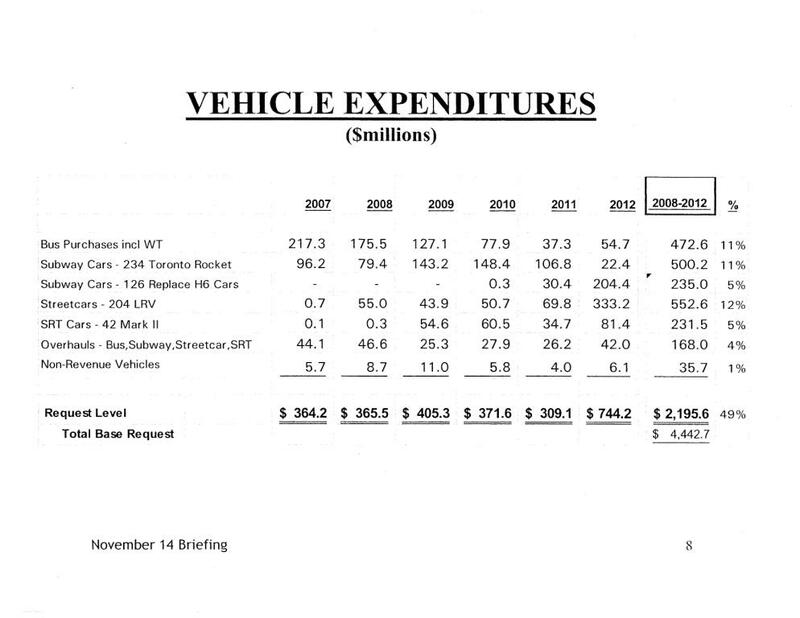 On November 14, the TTC gave approval in principle to the proposed 2008 Operating Budget. 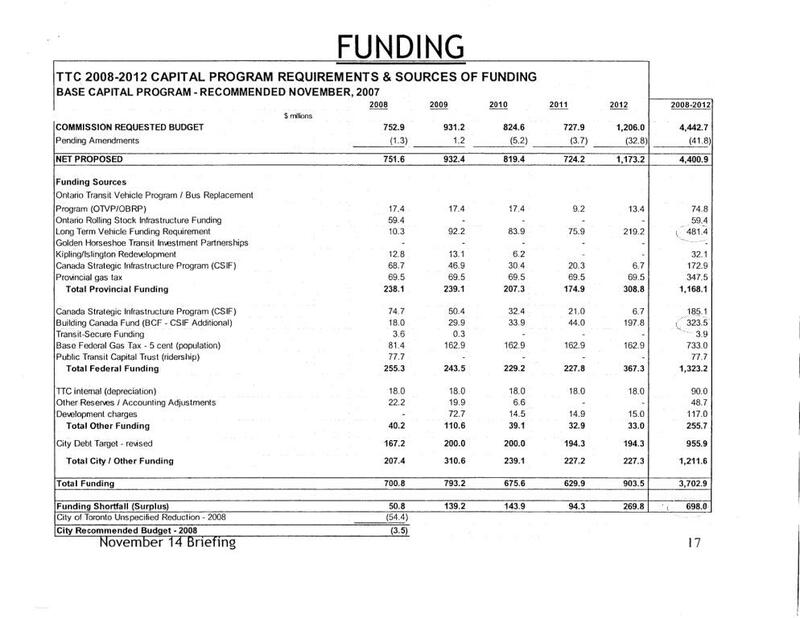 A short report is available online but it is missing one critical page, the table the table giving the details of the budget by major revenue and expense area. You can read the details in the report including a line-by-line discussion of the changes. Overall, the TTC’s operating expenses will rise about $74.6-million or 6.8% over 2007, and this does not include provision for wage settlements in the coming contract negotiations. Each 1% increase in wages translates to about $8-million in annual costs, of which $6-million would affect the current budget year because the new contract will take effect on April 1, 2008. 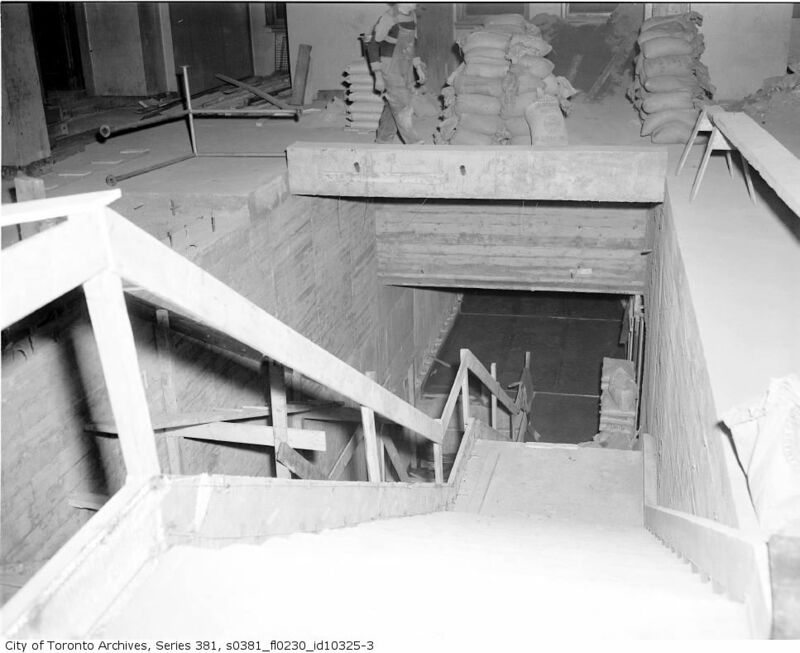 In the comments thread on my main Union Station post, some have remarked about a mysterious, abandoned tunnel that links Union subway station to the railway station. 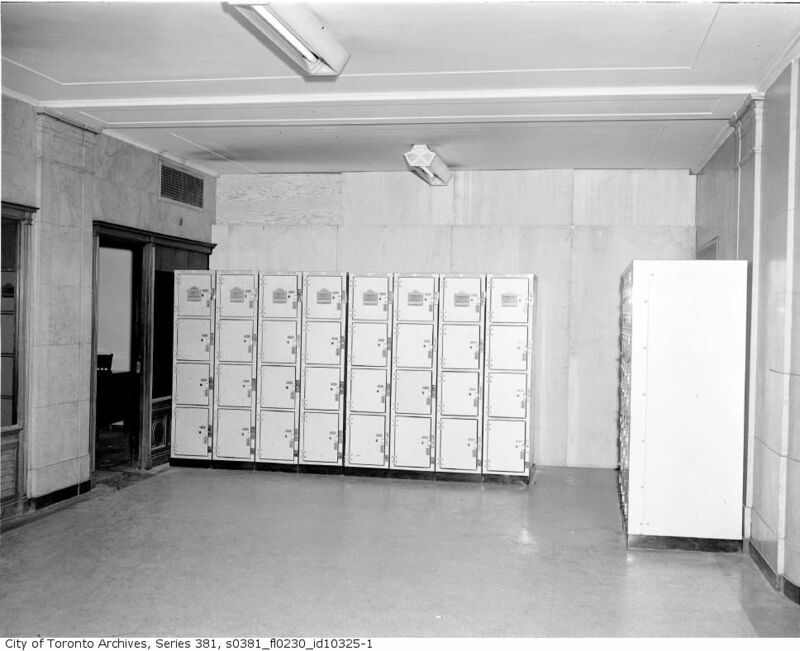 Scott Haskill from the TTC sorted this one out for us, and the moment I saw the plans and one of the photos, I had an “aha” moment and remembered the connection. Scott also pointed me to the City Archives. 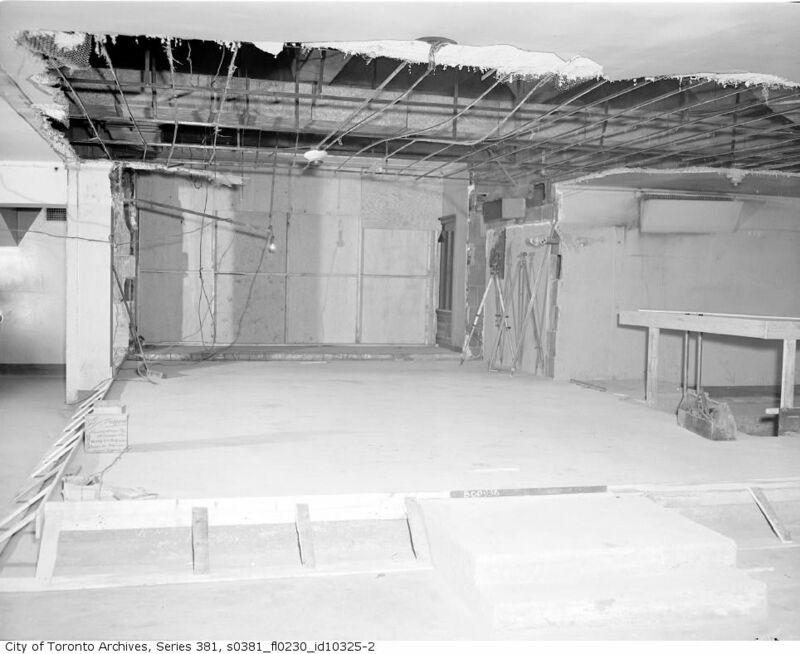 I went hunting and here are photos of the connection under construction in 1953: 1 2 3 4. 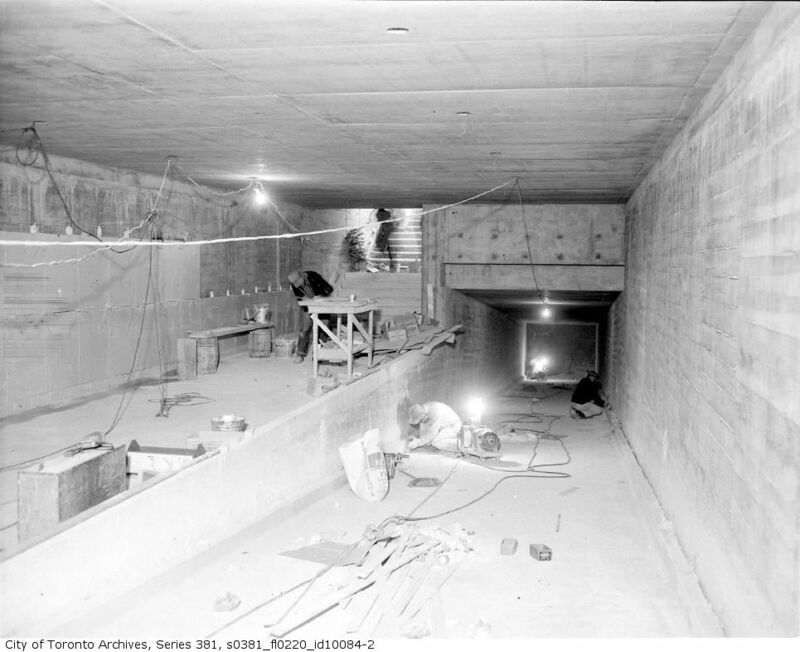 Here is an archive photo showing the connection tunnel under construction and a modern view of the same location supplied by Scott. 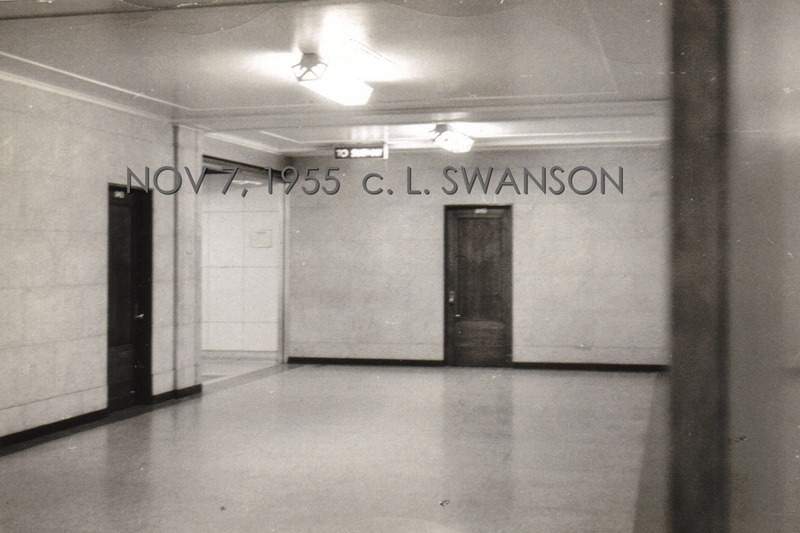 Robert Lubinski sent me a photo taken by Lewis Swanson showing the Union subway connection in Nov 1955. 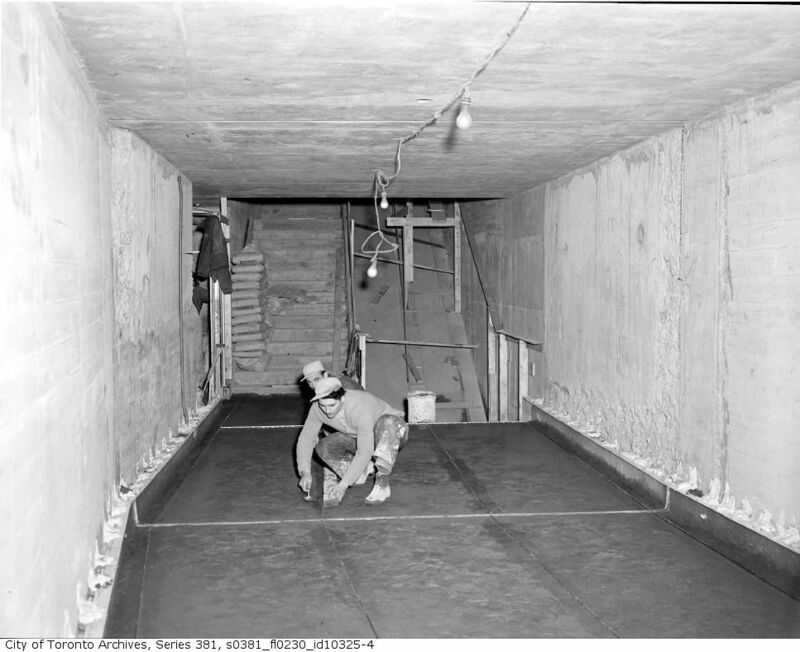 There is a page on the infiltration.org site describing this tunnel including a photo of its current state. 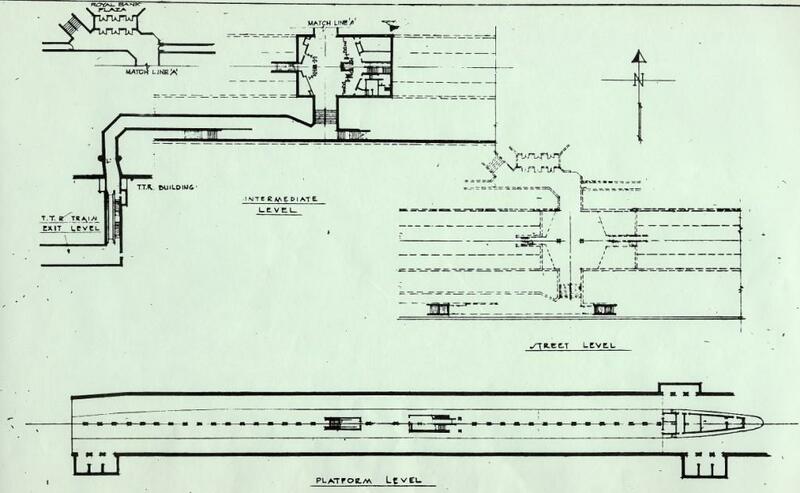 Updated at 3:00 pm November 16: The geometry of the Moat at the subway connection has been clarified further. Updated at 6:45 pm November 14: A description of the new treatment of the between the subway station and the GO Concourse has been added. Today in the Great Hall, Mayor Miller unveiled the latest proposal in the long story of Union Station’s revitalization. I’m not going to delve into this in detail, but want to give an overview to supplement the information on the City’s website.